Taste a selection of current wines while enjoying our winemaker-led wine tasting experience! Villa del Monte Winery is open one weekend per month and is located at 23076 Summit Road in Los Gatos, California in the Santa Cruz Mountains. You can reach us by phone at 1-408-353-0995 or 1-888-788-4583. 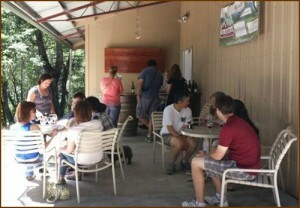 Tastings are typically held on our outdoor patio. Wine tasting flights are $5 per person, refundable with purchase. Wine tasting is free for wine club members. 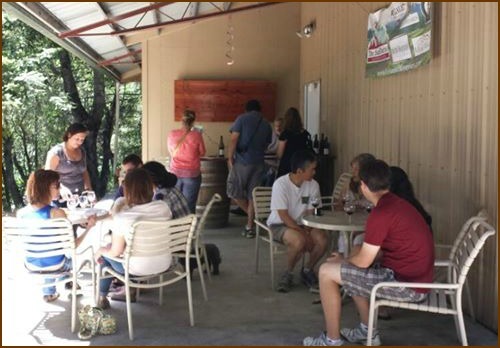 A wine tasting fee of $10 per person applies to private tastings or groups of eight or more. We invite you to learn more about the Villa del Monte Wine Tasting Experience. We are located at 23076 Summit Road. We are at the end of a private driveway and do not have signage on Summit Road. 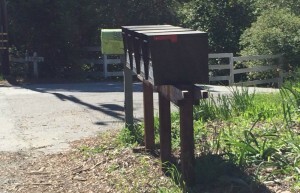 We recommend looking for this bank of mailboxes on the coast side of the road, about 1.3 miles south of the Highway 17/Summit Road interchange. If you plan to visit our tasting room with a group of 8 or more, please notify us at least 1 week in advance of your visit so that we can have the appropriate level of staff to properly host your group. A wine tasting fee of $10 per person applies to groups of 8 or more. A fee of $50 will be charged to your credit card upon making a reservation and the balance will be payable on the day of your visit. The reservation fee is non-refundable within 48 hours of your appointment. If you would like to make an appointment for a private tasting for a special occasion, please notify us at least 1 week in advance of your visit so that we can have the appropriate level of staff to properly host your group. A wine tasting fee of $10 per person applies to private tastings. A fee of $50 will be charged to your credit card upon making a reservation and the balance will be payable on the day of your visit. The reservation fee is non-refundable within 48 hours of your appointment. Please complete this form to make a reservation; we will contact you within 48 hours to confirm your reservation. Your reservation is not confirmed until we have replied to your request. When you are available for a tasting appointment?